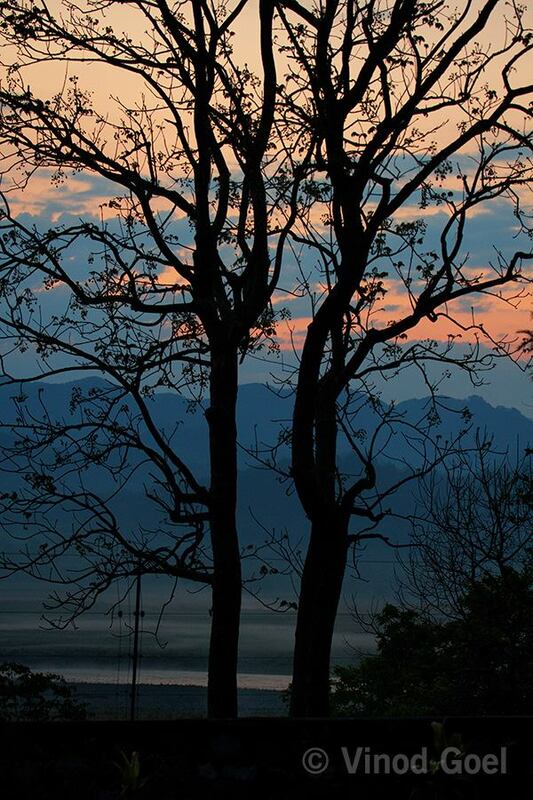 In the early morning I was dazzled to see the colors in front of me as soon as I came out of my hutment into the compound . There was some magic in the atmosphere which asked me to be ready in time. At right time we moved for the game drive .On the Sambar road we observed 3 elephants who had just entered the waters of the Ramganga river . 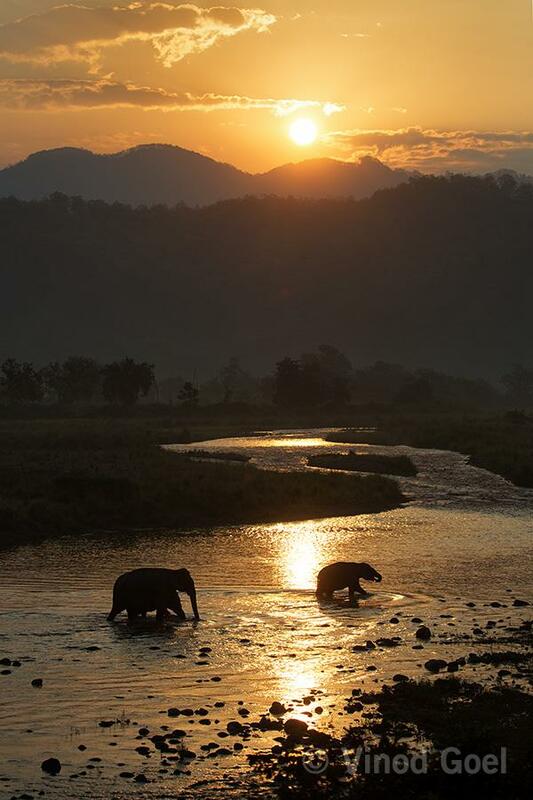 The bright sun rays were falling on the waters .I had a wishful thinking how nice it would be if the elephants crosses the sun glowed water in the river. Slowly they moved as desired and it was a great moment to see elephants crossing the golden waters. 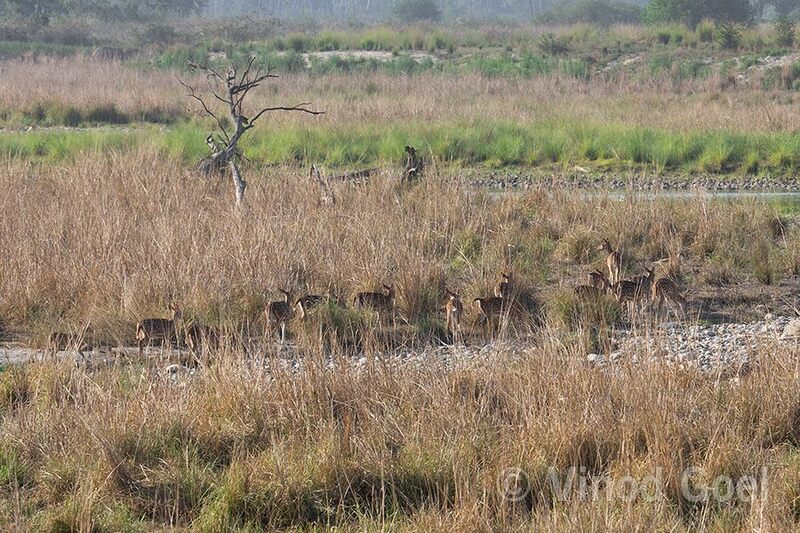 On the other side of the river while waiting at the high point looking into the river and the grass, we observed a herd of spotted deer was on a stroll on the river bed. They became very attentive and changed their path .My guide on asking told that the deer must have smell of the tiger, hence the route has been changed. After a few minutes while we were on round in search of the tigress ,one of the guide in the other vehicle informed about the call. We decided to move to our old position on the bank . In the mean time Nitya, my daughter heard a monkey call. This confirmed the movement of the tigress as her pugmarks were noticed in the lower region about 30 minutes earlier. 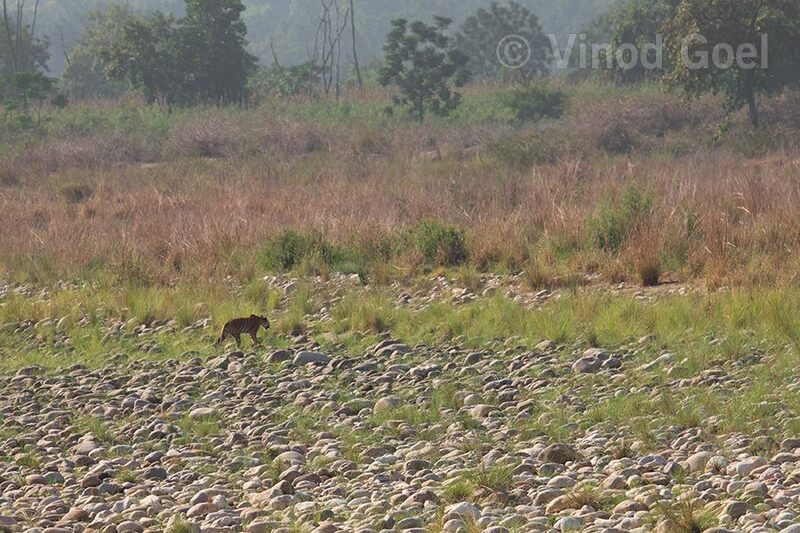 Then we noticed the tigress moving in the riverbed at about 300 to 400 meters from us. Based on the above movement all vehicles were coming to the Bhang vegetation. As the tigress was just to climb the area in front of her was a vehicle. Then tigress just changed her position. 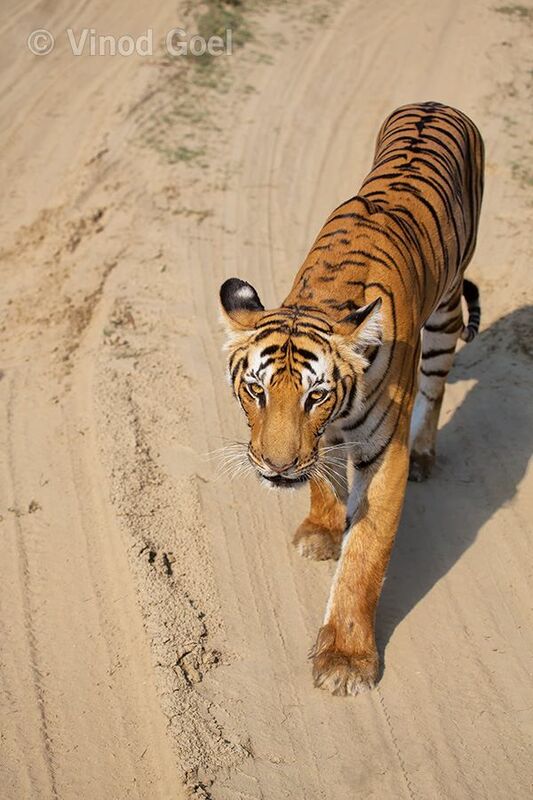 My driver also changed his position to the likely path of the tigress and for allowing me to have a descent shot. From my position I could have some head on shots. 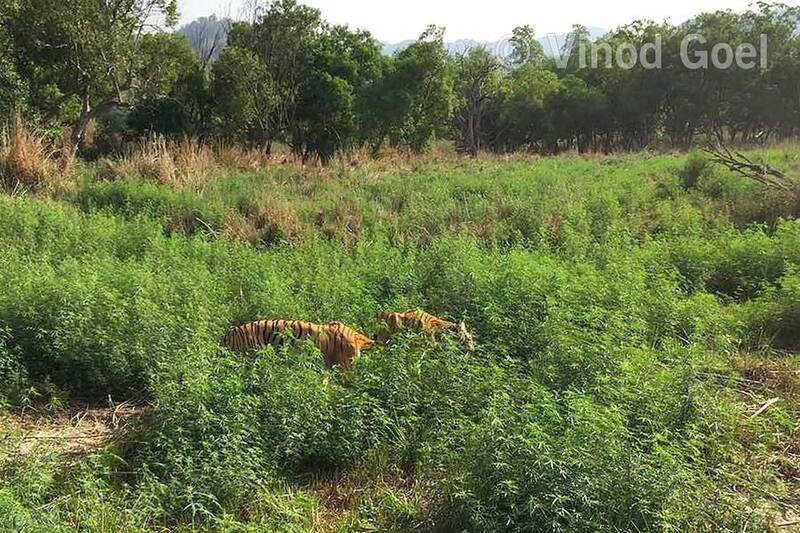 After crossing the bhang area the tigress came to the safari path. Now the tigress was between two vehicles and I was leading as it was coming towards my vehicle. In such a situation any wildlife photographer always gives space to the animal in between. Then what I found was the vehicle in my front did not move and the tigress was coming towards my vehicle. She almost touched the vehicle and I was looking into her eyes from the back of my gypsy. Not finding any space to move she turned back and again no space. 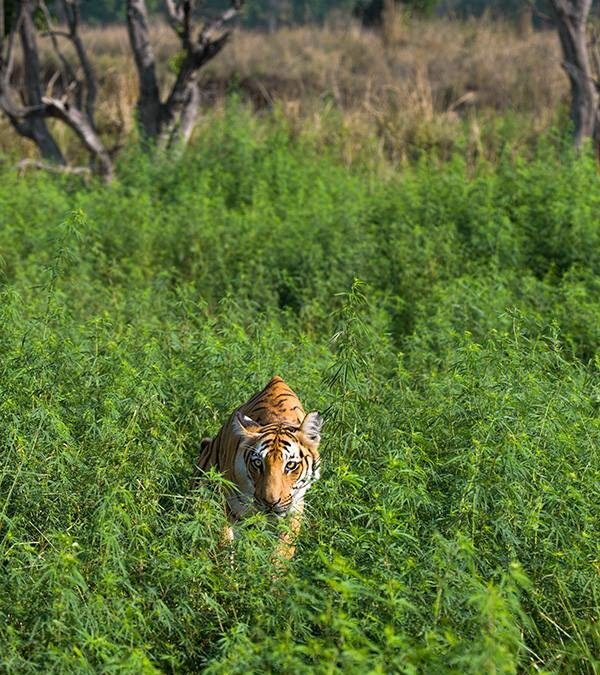 She left the main route and melted into the bhang vegetation and disappeared for some time. We all were wondering where she had vanished and where she would be. After 11 minutes we could see her moving in the grassland at about a km away from us. 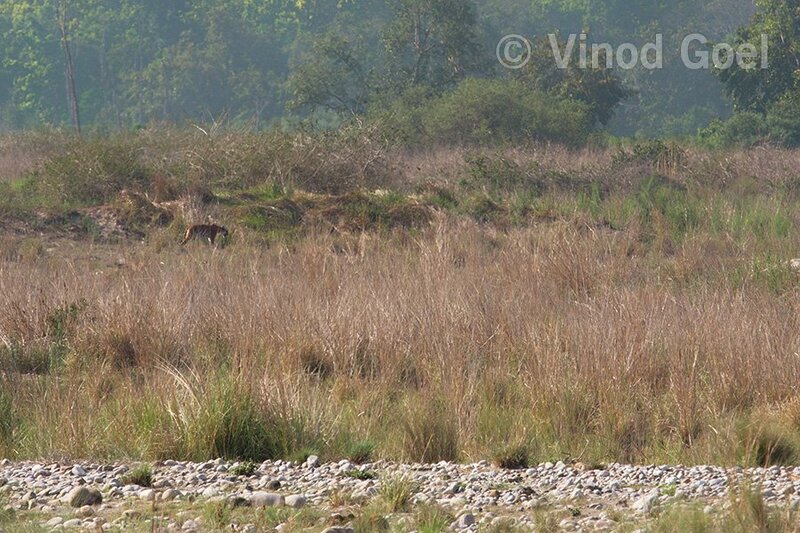 We also observed 2 sambar running for their life on seeing the predator. We then moved to the Sambar road to locate her but could not. 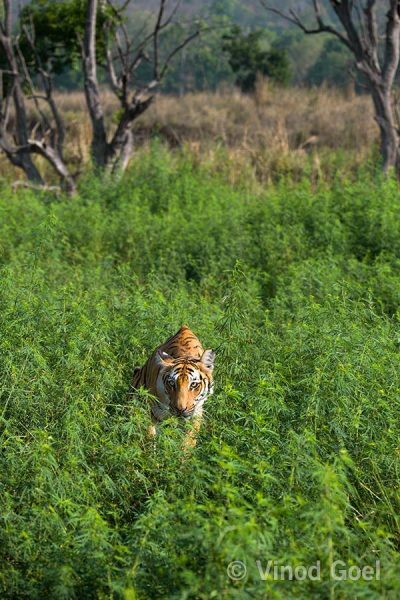 While we were reviewing the shots taken from various cameras and mobile it was gathered that while the tigress was moving in the thick bhang vegetation there was a male tiger too. In fact no body noticed his presence during a span of about 4 minutes. As I was having 100-400mm zoom lens and my concentration was on the tigress itself and the movement being fast ,no body ( about 10 vehicles ) including me noticed the presence of a big male.. My sister in law just clicked a few shots from her mobile phone on seeing the tigress from the front seat in the gypsy. She too was surprised to see two tigers on the screen .She just clicked and she got the jack pot. What a great luck. Later on it was gathered that the male in question is very shy and rarely seen by the visitors. I have been coming to this park from the year 2005 and this was the closest encounter with the big cat where I was seeing in her eyes just 2 meters away from me. Secondly although there were more than 10 vehicles following the tigress but no body observed the presence of a male tiger. Another wonder. In fact we observed the tigress from a close distance for full 4 minutes. But I am still not able to comprehend the non visibility of a huge male in the green vegetation.